How meaningful is that quote? I have the habit of listening to the FM radio on the way to my work and sometimes way back from work. My kids also get a share of the world news. For the past 2 weeks they have been following the disappearance of the Malaysian Airlines and it was heartbreaking when the announcement came that the plane was lost in the Ocean. Yesterday when I told them the news, they were so upset. I still like to hope for the best since there was no solid evidence attained to prove that it was lost in the ocean. Hoping for the best and abiding in your faith keep you hanging in there to hurdle the day to day trials and tribulations. It always concerns when you don't hear from someone you know for sometime or you don't see them for long time. I started noticing this homeless lady from last year summer on my commute to work. She carries 2 large bags on her hands and walks everyday on the sidewalk of a busy street. She then disappeared during winter, but when I saw her yesterday on the street walking, there was a slight relief inside that she is still there. We may not need to know someone personally to have a concern or care for someone. For all the 239 people who boarded the Malaysian flight and the families who are desperately waiting for their return, all we could do is hope their prayers be answered and their ordeal come to a closure soon. I have been stumbled on Fennel recipes for a long time on blogsphere and was deliberately putting it away into the back burner due to my prejudice. Even though we use the seeds in Indian cooking, I was never daring enough to use the bulb. The other day I got a chance to check out the farmer's market that was opened recently near my home. The Fennel bulb was so gorgeous and fresh sitting on the produce aisle which was hard to bypass. So I picked up them and came home and tried this wonderful salad. This was one of the best warm salads I had tasted. 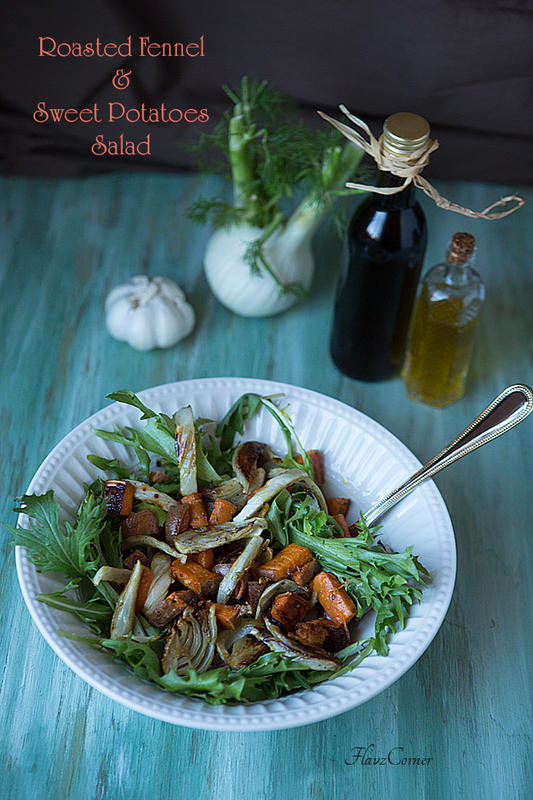 The aroma of roasted fennel was so divine and it didn't have the pungent taste after cooking. I made them yesterday again and my kids ate them without adding it to the salad greens. You could even serve it as a snack. I was totally impressed by the way it turned out and I highly recommend you to try this recipe. I even sent a snapshot of the salad to my friend soon after taking the first bite. So you could imagine how excited I am to share the recipe!!! Fennel bulb not only tastes wonderful, they are very healthy too. 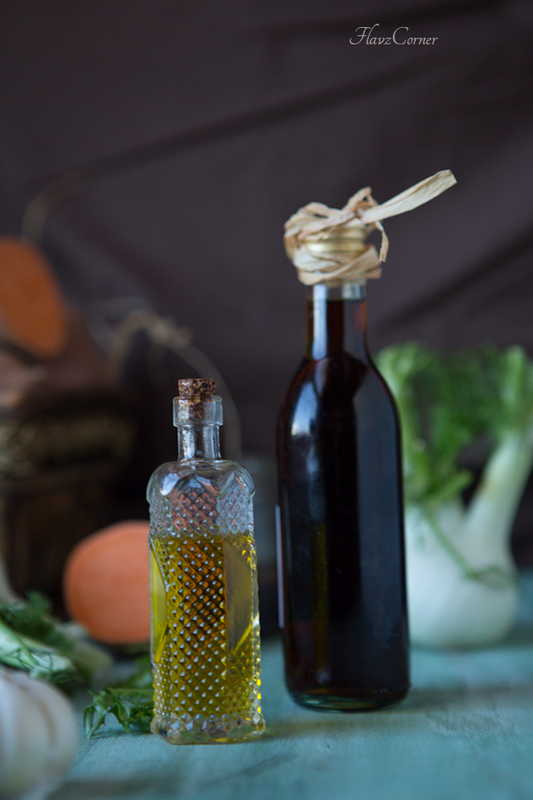 The phytonutrient Anethole, found in fennel has shown to reduce inflammation and to help prevent the occurrence of cancer. They are the excellent source of Vitamin C, an antioxidant that can neutralize the free radicals and boost up the immune system. 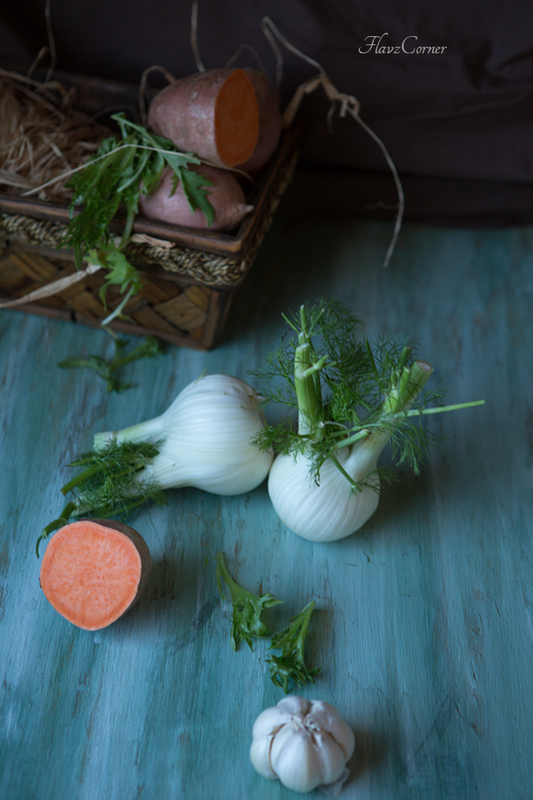 The high content of fiber, folate and potassium in Fennel bulb promotes cardiovascular and colon health. A fresh Fennel bulb will be clean, firm and solid without spots or bruises. These white bulbs usually are sold with stalks and they should have fragrant aroma. They are available from fall through early spring. You can store them in refrigerator with plastic wrap for retaining their crispiness for 1 week. It is better to use them when they are crisp and fresh. Add all the ingredients for the Vinaigrette in a bottle and secure the lid and shake well. Keep it refrigerated till ready to use. Pre heat oven to 400 ° F.
Wash the fennel and cut the stalk and little bit of the base part. Slice them length wise into thick pieces as shown in the above picture. Scrub the sweet potatoes, wash and pat dry. Cut them into bite size pieces. 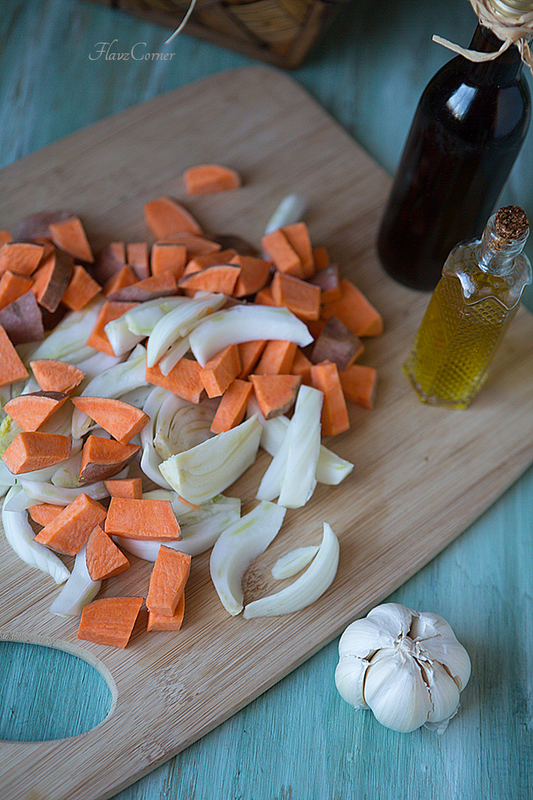 Sprinkle all the ingredients for seasoning over the fennel and sweet potatoes and drizzle with olive oil. Transfer to a baking sheet and bake for 20 minutes, by flipping the veggies after 10 minutes. Let it cool and get to luke warm temperature. Divide the greens of your choice for the salad in the 2 salad bowl. 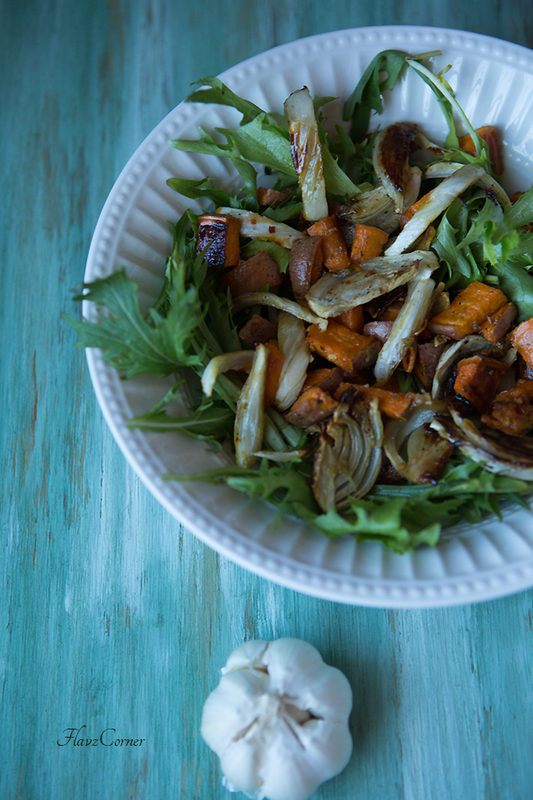 Top them with half the quantity of the roasted fennel & sweet potatoes in each bowl. Drizzle with the vinaigrette and enjoy the warm salad. Its absolutely delicious!!! Beautiful flavours! Roasting makes veggies taste so much better! Lovely salad! The flavors and textures must have been amazing. Love the pics, they look so beautiful, especially the colour of that board. I love fennel! It's particularly nice roasted. Never combined it with sweet potatoes like this, but I will -- the combo sounds so fantastic! Super stuff -- thanks so much.